From the age of five, Frank was so fascinated by these racing yachts, he began sketching and painting as many of these yachts as he could, and as toys were hard to get then, he started making working models of these yachts. As each year passed, these models became more detailed and accurate, along with his paintings. The model boat building turned out to be a practical tool to learn about the structure and shapes of all the different vessels, a knowledge that was very beneficial for getting his paintings accurate. By the time Frank was eight years old, his father got him a Sabot to learn to sail. Also he, and his brother would go to the mainland nearly every second day on his Dad’s boat to take guests to and from the resort, so they both got their sea-legs at a young age ! By his early teens, Frank was working as a deckhand on fishing and charter boats. During the lulls, Frank applied himself to model making and painting, using his experience to capture the essence of the sea in all it’s various moods. This realism style of painting the sea has become his signature trademark. Frank left Queensland when he was 22 to travel and work around Australia, getting work where he could, and ended up in Melbourne, and stayed there for five years before moving to Sydney, where spent the next twenty five years, and worked as a graphic artist at various advertising agencies. In this period he still spent most of his spare time on painting, and model making, and also crewing on racing yachts when possible. In this period he built six models for the Australian National Maritime Museum in Sydney, including the model of “Hong-Hai”, one of the first Vietnamese refugee boats to come to Australia. Frank’s work has been shown in various exhibitions, the first, a shared exhibition in 1988 with renowned artist Robert Carter, at Seaways Gallery in Balmain, Sydney. His second, a solo exhibition, was held aboard the then Sydney Maritime Museum’s restored old 1912 Sydney steam ferry, “Kanangra”, at Darling Harbour in 1988, followed by a shared exhibition at the Boronia Gallery at Mosman, Sydney. His last showing was at Hardy Bros. Jewellers in Brisbane in 2007. Frank’s art works have also been published in many magazines and history books in Australia and England, and also in documentary films on Australian history. Frank moved from Sydney to the Gold Coast in 1999, where he was commissioned to build scale models for the local companies such as Riviera and Australian Motor Yachts, etc. Most of these models were displayed at the Sanctuary Cove International Boat Show, and other boat shows around the world. To date Frank has built 65 models ( not counting those he built as a child ! ) and has restored at least 15 other historic models for various collectors over the years. In 2008 Frank moved to Tamborine Mountain, just 35 kilometres west of the Gold Coast, and is now devoting most of his time to painting. As can be seen here on his Gallery, Frank can paint any type of vessel accurately depicting it, either in calm or rough seas. 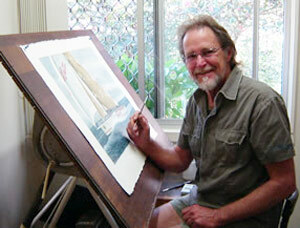 Whatever the setting, whether it be modern, historical, industrial, or the open sea – Frank’s meticulous skill is apparent!